Preschoolers explore different pencil grips before finding the right one! 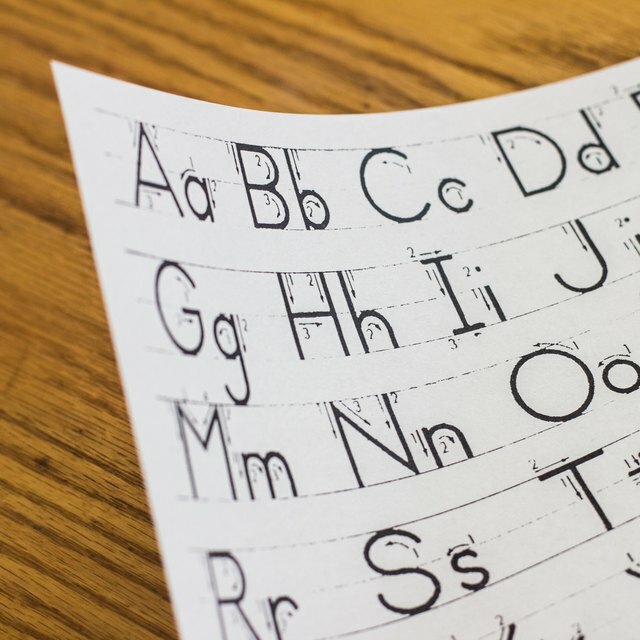 Once your preschooler recognizes her first name in print, she can begin learning to write it. 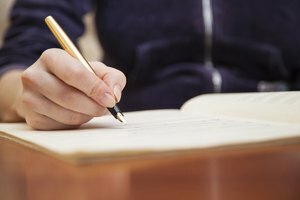 Writing is a complex skill that requires hand-eye coordination, wrist strength, hand control and finger dexterity. 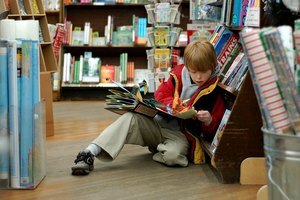 Moreover, writing practice requires a willingness to sit still for five minutes -- a hard task for many preschoolers. 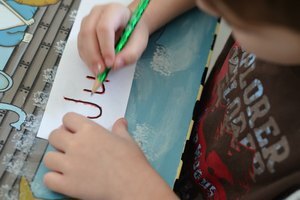 A variety of fun activities will help your child see name writing as a game rather than a chore. You'll have her signing her name with a flourish in no time -- and over everything! Abandon pencil and paper activities for now and let your preschooler enjoy some shaving foam finger writing. Messy? Yes, but worth the effort because you can help your kid learn to form the letters of her name smoothly and cursively by gently guiding her hand movements through the foam. This helps prevent the development of habitual and incorrect stop-starts in her letter formation. Preparation akin to military precision is vital. Place waterproof, washable covers over the floor and table top, and wear aprons. Use unperfumed shaving foam, especially if your child has an allergy, such as eczema, and discourage her from putting her hands near her eyes when using the foam. Spread the foam evenly over the table and begin the name signing! A lap-sized whiteboard and whiteboard marker pen both offer an erasable option that is suitable for short and frequent writing practice. Write your child's first name in dots onto the whiteboard and then let her join up the dots with a colored marker pen. 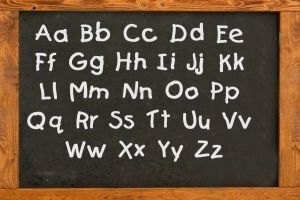 Use an upper case letter for the first letter of her name and lower case for the remaining letters, rather than using only capital letters. Encourage your child to join the dots on the capital letter of her name first, and then to move her pen over the other letters from left to right across the board. 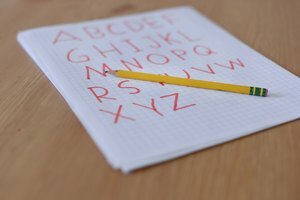 Write your child's name in pencil using large letters onto a sheet of white construction paper and let her swirl brightly colored paint over each letter. Painting uses large arm movements and is particularly suitable for children who struggle with pencil grip and who may become disinterested if they are forced to hold a pencil correctly before they are ready to do so. 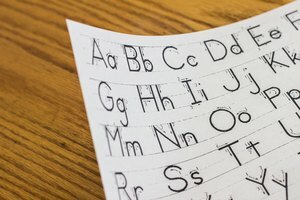 Once your child is ready for more structured name-writing practice, you can help her adopt a left-to-right writing habit by writing her first name at the upper left hand corner of the paper. If your child is left-handed, tilt the paper slightly to the right and if she is right-handed, tilt it slightly to the left to enable correct posture and hand positioning. Write your child's name in pencil and let her use different colored crayons to trace over each letter. As she progresses, add further challenge to the activity. Write the upper case initial letter of her name and then let her fill in the rest, or write every other letter of her name and let her fill in the blanks. Vickers, Julie. "Different Ways to Help Preschoolers Write Their Name." Synonym, https://classroom.synonym.com/different-ways-preschoolers-write-name-47443.html. 26 September 2017.